This year’s annual Palm Beach County Medical Society Holiday Gala was held on December 2, 2017, at the Kravis Center, Cohen Pavilion, in West Palm Beach, Florida. During the event, which was attended by 300 guests, Dr. Brandon Luskin of Orthopaedic Surgery Associates in Boynton Beach was welcomed as the incoming president of the PBCMS. 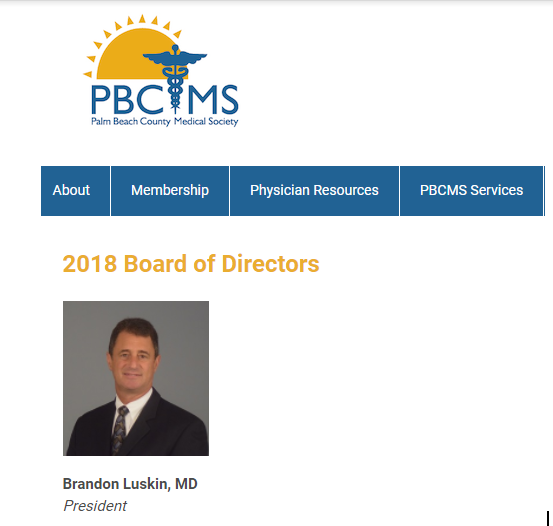 PBCMS is a not-for-profit organization dedicated to uniting physicians to serve the common interests of the profession, developing and maintaining the highest professional and ethical standards, advocating for the interests of physicians and their patients, and collaborating with others to improve community health1. Over $85,000 was raised during the 2017 Gala to support the Medical Reserve Corps, medical education programs and Project Access, which provides health care services to low-income, uninsured residents of the county. Congratulations to Dr. Brandon Luskin, the new President of the Palm Beach County Medical Society.